2014 has been a year of reflection across Europe as the impending centenary of the start of the First World War draws near. This anniversary year is rightly being commemorated extensively by broadcasters with many hours of television and radio programming dedicated to exploring the complex causes and profound legacy of this distant conflict. One of the most impactful programmes has been BBC’s ‘The Great War’ narrated by Jeremy Paxman. By interspersing the horrors of the Western Front for those on active military service with reflections on social, political and economic life back home in the UK, this ambitious series succeeds in giving the viewer a truly widescreen perspective on the 1914-18 conflict. 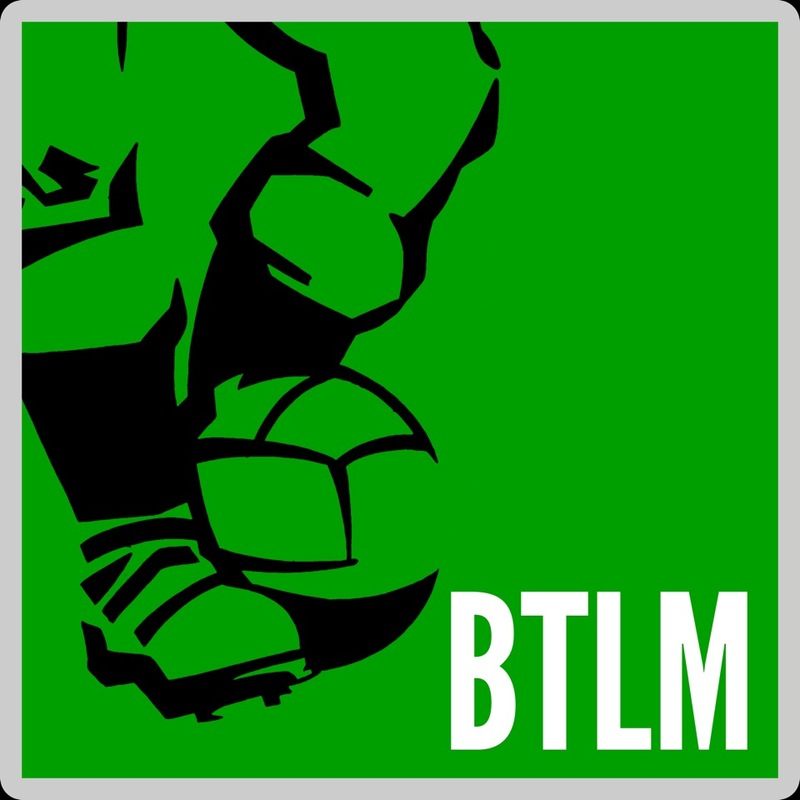 With this bigger picture in mind, BTLM started pondering what organised football looked like in that immediate pre-War era and just how recognisable it would be when set against our contemporary understanding of the game. So in a flight of fancy we’ve taken modern football’s most popular and successful annual club competition – the Champions League – and imagined how it might have looked had it existed one hundred years ago. The season in question we are reimagining is 1913-14, the last one to be completed before the war to end all wars changed the face of the continent forever. It’s not an especially radical idea. This particular season comes some 42 years before the start of UEFA-organised European club competition as we know it today, but even back in 1913 the idea of cross-border club competition was already well established. Two editions of the Sir Thomas Lipton Trophy had brought together club sides from Italy, Germany, Switzerland and England and we were little more than a decade away from competitions like the Mitropa Cup and the Coupe des Nations which would further popularise the concept. How different was the geopolitical situation in Europe a hundred years ago? How closely can we stick to the contemporary format to decide entrants at a time when so few countries were running organised national Leagues? How many successful teams from 1913 are still recognisable today and what became of the rest? As a continent along the lines of how we recognise it today, Europe only began to take shape in the early part of the 20th century and was suffering considerable growing pains as the dark clouds of war formed. Even as late as 1913 there were a number of countries that either did not exist as we know them in their modern form, or were divided and under the control of one of the continent’s great empires. So our throwback Champions League would not feature teams from Finland or Poland with these countries under the yoke of Russia, Germany or a combination of both. What would become Czechoslovakia was then known as Bohemia and was a province within the Habsburgs’ Austro-Hungarian empire. And closer to home Ireland was still eight years away from partition and thus lacked the geographical divide between north and south. The contemporary Champions League format grants qualification to the national champions of each UEFA member state, plus a variable number of additional places allocated to each country based upon a performance based coefficient. We have created a hybrid system for our 1913-14 competition which bases the number of extra places awarded upon a combination of the respective footballing and political strength of each nation at the time. For example Austro-Hungarian teams have four places (two for Austria, two for Hungary) and benefit from the influence of the sizeable Empire they represent. Scotland is awarded three places partly for Empire reasons and partly because of its strong standing in the European game at the time. Once we have decided how many places are given to each country, a problem arises in how best to nominate the most appropriate teams to fill them. A century ago just England, Scotland, Denmark, Iceland, Austria and Hungary ran organised national League football as we recognise it today. While most other significant European nations did have some form of organised competitive football back then, national champions were generally decided via a knock-out competition featuring a loose coalition of regional cup winners. So in countries like France, Spain, Germany, Italy and Serbia we have nominated the Cup winners as that country’s champions and filled the other allocated coefficient places by adding the Cup runners-up and, if necessary, the defeated semi-finalists. In countries without any national Cup competition as such, we’ve used whichever competition identified as the most prestigious in that country at the time. Some countries would miss out on our Champions League. Football was being played in Bulgaria in such an ad hoc manner that it was impossible to discern any sort of recognisable team worthy of representing the country here. Greece and Turkey were embroiled in fighting the Balkans War so football was suspended in both countries during this time. And from Ireland we have chosen Glentoran ahead of Leinster Cup winners Bohemians of Dublin as football was both more popular and developed in Belfast than in the south. The Welsh Cup winners were Swansea Town Reserves and with their first team playing in the English Southern League, we can’t imagine their second team being allowed entry here. The absence of Russian participation is something of a curiosity. Football was being played there on a fairly informal basis and an Odessa XI claimed the title that year by defeating a St.Petersburg XI in a play-off. In a situation that seems closer to 2013 than 1913, the Odessa select was subsequently stripped of its title for fielding four foreign players instead of the permitted three in the de facto Final. We are left with a field of 42 teams (see the illustration near the top) and we would envisage a preliminary round with 20 of the lower ranked teams playing off home and away. The winners would join the other clubs to make 32 and due to the difficulty of travel then, our Champions League would become a straight knock-out home and away tournament – much like the European Cup format – with a one-off Final to be played at a neutral ground. 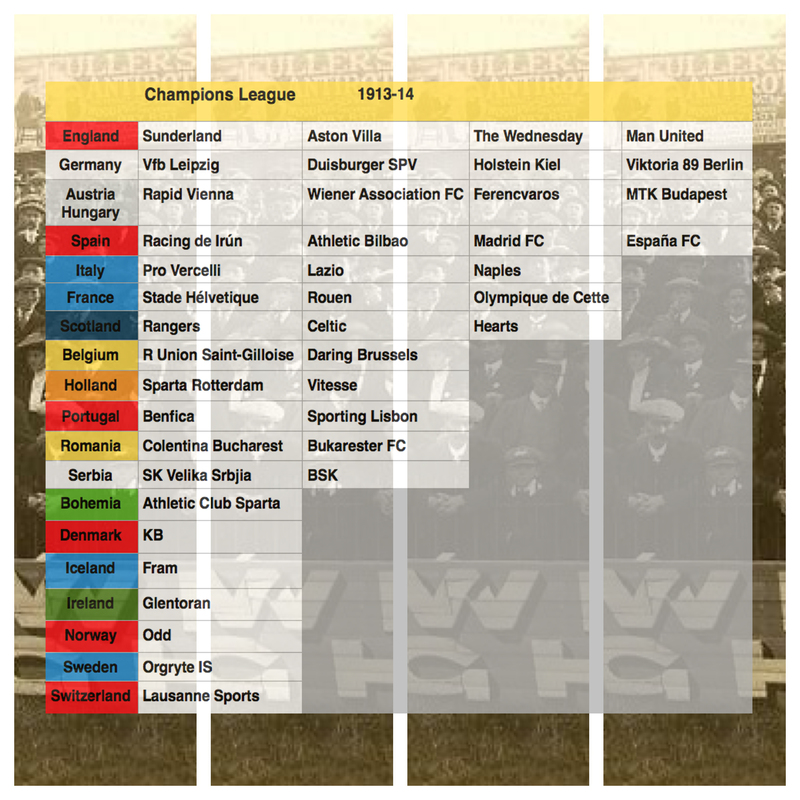 Many of our competition’s participants will be familiar to readers, so in the next part of this story, The Champions League 1913-14 – The Teams, we’ll look in depth at the more obscure clubs among the elite of the European club game a century ago – a number of whom had ceased to exist altogether by the time the First World War ended just a few years later in 1918.